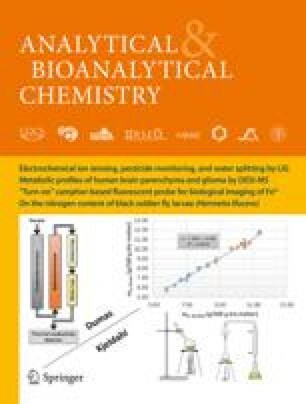 The suitability of 1-nitroso-2-naphthol as a complexing agent for on-line preconcentration of copper using RP-C18 material in a microcolumn with flow injection coupled with flame atomic absorption spectrometry (FI-FAAS) has been tested. Various parameters affecting complex formation, such as pH, sample flow rate, etc. and its elution into the nebulizer of FAAS were optimized. ¶A 5 × 10–3 mol/L reagent was on-line mixed with aqueous sample solution acidified with 0.1% (v/v) nitric acid ¶(pH 3–4) and flowed through the microcolumn for 30 s. The adsorbed complexes in the microcolumn were eluted with ethanol in 10 s into the nebulizer of FAAS. A good precision (1.7% for 50 μg/L copper, n = 12), high enrichment factor (19) with detection limit (3σ) 2.0 μg/L, and sample throughput (90 h–1) were obtained. The method was applied to certified reference materials seawater, mussel (biological), NBS-362 and NBS-364 (special low alloy steel), for the determination of copper, and the results were in good agreement with the certified values.